September 21st – the Autumn Equinox. Day and night are exactly the same length. This event must have some significance for any society which watches the sky. 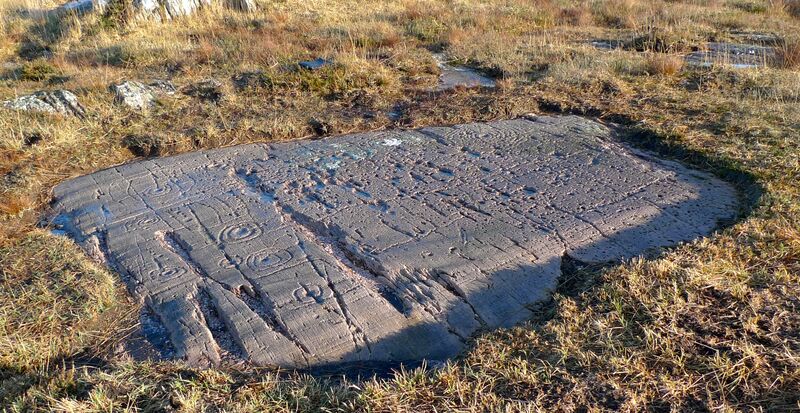 We can never know for sure, but it does seem possible that the enigmatic stone structures we find out in the remote landscapes of Ireland: megaliths, circles, stone rows and – dear to us – Rock Art, could have been inspired by celestial observations. Finola put up a post on the Spring Equinox at Bohonagh, and we have written about the Spring Cross Quarter (Imbolc). We are fortunate that today’s weather has been idyllic – cloudless and with a clarity of light – so we headed out to Derreenaclogh to watch the sun setting. We have studied this rock in depth, throughout the year and in all conditions. Our work has produced a detailed measured drawing of the intricate markings on the surface, carved by our ancestors perhaps three or four thousand years ago. During our many visits we have noted – but perhaps neglected – the other carved rock at Derreenaclogh, which is situated only a few metres to the east. This has suffered considerable weathering and surface erosion which the first rock escaped, somehow or other, by being preserved for years – centuries – perhaps millennia – under a covering of soil and furze. Nevertheless, today the very faint markings seemed to be more alive – as if the low sunlight on this evening was exactly right for observation. 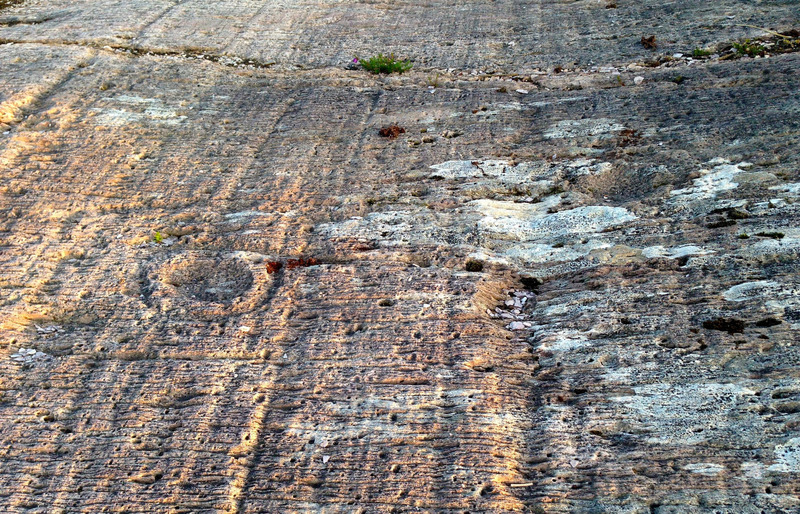 We could see marks on this surface we had never made out before. Derreenaclogh Number 2 deserves a detailed study of its own – something else to keep us busy for a while! The sun duly sank below a hill – not a particularly significant part of the horizon. Mount Gabriel, meanwhile, further to the south, gathered some rather spectacular clouds around itself: it could be that this landscape profile is a sunset marker at another calendar point. We did see that the ‘ray’ on the large motif with eight concentric circles seemed to be aligned with the setting sun – could that have been important? It was such a beautiful evening that wherever that sun had landed, or whatever alignments may or may not be visible, we would have been perfectly happy. As we made our way back to Nead an Iolair we said to ourselves – again – that this West Cork scenery is unbeatable: we are so fortunate to be immersed in it. 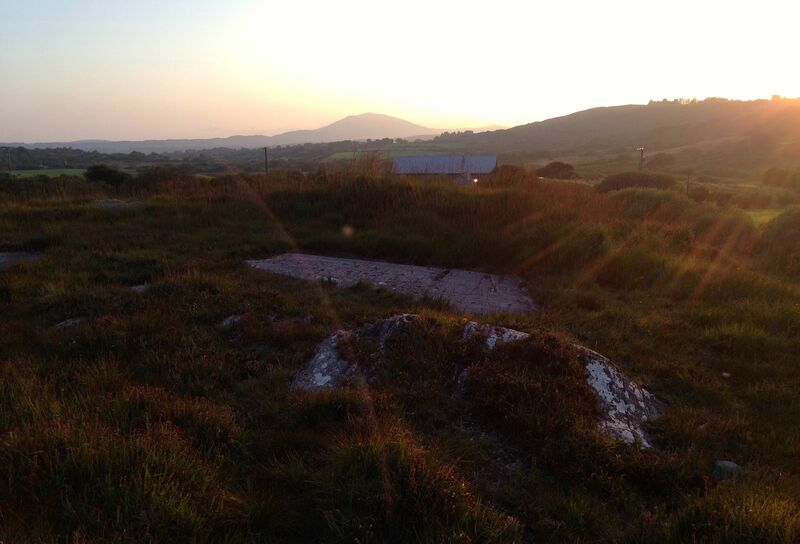 This entry was posted in Archaeology, Derreenaclogh, Roaringwater Bay, Rock Art, West Cork Blog and tagged Autumn Equinox, Bronze Age, Rock Art at Derreenaclogh, Sunset Alignments. Bookmark the permalink.